Well no surprises here. Clarins #230 makes the top of the list for our most lemmed after polish. But before I go on, I'm going to vent. See that middle one below titled 'Lemming'. Well that percentage of people wrote something along the lines of "I don't know what a lemming is". Seriously, when I did my giveaway, the post that was only two days before it was about nail blogger lingo, and explained what a lemming was. I just love people that waft in, enter my giveaway, leave and don't read another damn thing. There like someone in the supermarket that walks down a isle, farts and keeps walking. But for those that are still reading, thank you! I remove it if it was only a general brand comment "would love to try Deborah Lippmann or RBL"
I removed it if it was only a general finish comment "any holo or duochromes"
I removed if it was not a nail polish - yes, there were some entries that had lemmings other than nail polish! 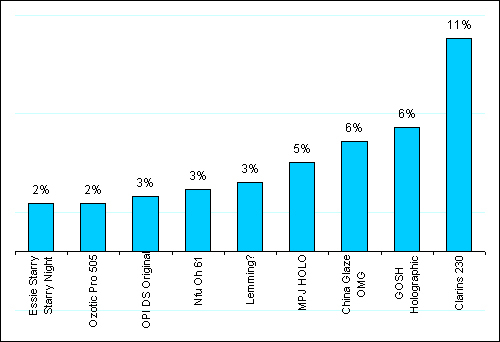 A total of only 58%, so the remaining 42% of people all lem for a polish that no one else did. I was lemming GOSH Holographic, but now its 230. Finally, there was only one mention of this, but there is another kindred spirit out there who said they lemmed a "Magnetic Holo", that’s exactly what I said when Scrangie did her post about what sort of polishes we want to see more of. How freaking awesome would a magnetic holo be!! Here is my photoshoped version of a magnetic holo. I wanted to do a star shape, but my photoshop skills aren't good enough, and although I can imagine it in my head, I couldn't exactly work out how to create the various light and shadow reflections for a star, so a circle it is. Oooh, magnetic holooooo. *falls over dead* THAT WOULD BE AWESOME. I just realized. What color should I do? I have blue, charcoal, green and a purple-y color. Laura - I never thought to try frankening one. Im totally going to try that too. But like you said picking a colour will be hard. 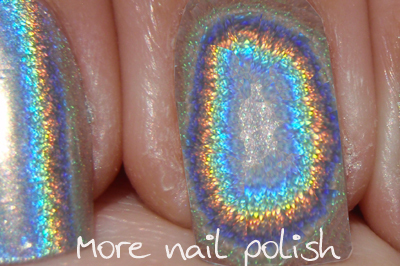 Wow, imagine that, magnetic holo! I'm drooling!!! You did a fine Photoshop job. I'm surprised OPI DS Glamour didn't make it to the list of lemmings.